Battambang is the second-largest city in Cambodia with a population of over 250,000.It is about 291Km from Phnom Penh City (The Capital of Cambodia). Even it is far from Phnom Penh, but it has many interesting and attractive places to visit. Tourists can visit this province anytime because the wheatear is always nice for all seasons. Battambag is home to some spectacular sceneries, which makes walking, tramping, and sightseeing a must for any visitor. Numerous historic ruins are open to the public, one of which is Wat Ek Phnom which was built in the 11th century during the reign of Soriyavaraman I (1002 – 1050), but now sits within the grounds of a modern pagoda. The temple is surrounded by 18 bodhi trees. The abundance of water in the form of lotus ponds, streams and the like give this place a relaxing feel. The temple and ruins lie 10 kilometers north of the Cobra River, and are at the bottom of a hill, hence only limited exercise is required to reach them. 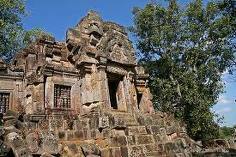 For a more enduring experience, Phnom Banan is a mountaintop temple built in the Angkor period. The temple is still in relatively good condition, however pillaging and looting was once rife in the area, and the effects of this are noticeable. Nevertheless, this is an excellent sight to see, and any tourists to the area should be sure to check out at least a few of the many temples, as they certainly build a cultural and historical awareness. Other attractions worth a note are the Phnom Sampeou Mountain, the Kamping Puoy Reservoir - an incredible engineering project, Wat Pee-Pahd - an important symbol of Buddhism in Battambang, and the Gold Buddha Hill. As you can see, a tourist will not be lost for things to do in the province. Banan temple is located in Kanti II commune, Banan district, atop a 400-meters-high mountaintop, about 25 kilometers south of the provincial town. This sandstone and laterite temple was built between the mid 11th and late 12th centuries. Work was started under King Udayadityavarman VII (AD 1181-1219). The temple has five towers similar to Angkor Wat, but it was a moat and two natural wells, Bet Meas and Chhoung. 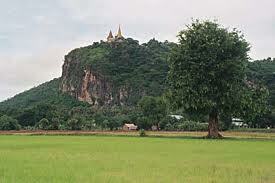 Wat Ek Phnom temple is located in Tkov village, Peam Ek commune, about 14 km from Battambang provincial town. 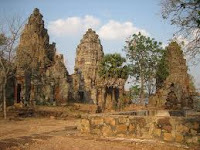 The temple was built in AD 1027, during the reign of King Suryavarman I. there are 18 bodhi the trees around the temple. They are lovely to look at and provide abundant fresh air. They are temple to look at ad provide abundant fresh air. Outside the temple to the south, there is a moat that is now a pond. Phnom Sampeou is a natural site located along Nateral Raod 57 in Sampeou commune, Battambong district, about 12 kilometers from the provincial town. Atop a 100-meter-high mountain stands a pagoda and three natural caves: Pkasla. Lakhao and Aksopeak. Pkasla cave is full of uprooted stones and is considered important because it is where Phnom Sampeou residents come to celebrate after a marriage. Next to the Phnom Sampeou are several important mountain clusters, including Phnom Kdaong, Phnom Krapeu1 Phnom Trung Moan, Phnom Trung Tear and Phnom Neang Romsay Sok. 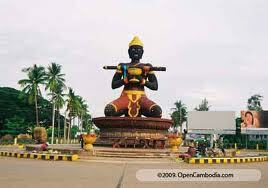 All are related to the Khmer folktale titled Reachkal Neang Romsay Sok.